Crowder Supply keeps a large stock of finished thread combinations in stock in both standard and HD shanks. Additionally we keep a large stock of Through-Hardened Rotojec Shank Blanks to run RUSH orders. Typically we can have any thread combination done in 1-3 days with machine set up fee. Machine set up costs on RUSH or less than MOQ orders is $175.00 per thread. Assembly consists of a Grout Body and a Rotojec Shank. In order to have a complete Grout Swivel Assembly, you must order both. 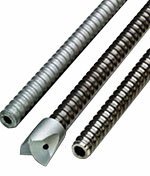 Call to inquire about the Super Duty bodies and shanks recommended for tough conditions installing 3" grout rod. Collared Grout Shanks are made on request. They are $125.00 more expensive than the standard shank price. Contact us to place an order for the Collared Grout Shank. 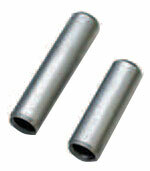 Swivels are machined and heat treated while sacrificial grout rod is relatively soft. In heavy percussive applications it is not uncommon for the grout rod to deform inside of the swivel causing the rod to stick inside the Rotojec shank. Swivel savers are designed with a shortened male thread to facilitate removal from the shank and send the percussive energy through the shoulder of the swivel. If a rod becomes stuck in the swivel saver – you should be able to remove the hardened saver from the hardened shaft and extract the softer grout rod from the saver "at your convenience.” It is also common to use these savers as adaptors to effectively drive several different sizes of grout rod with the same Rotojec shank. 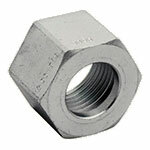 The above image consists of a shank adaptor, coupling adaptor, a grout swivel assembly, another coupling adaptor, a sacrificial grout rod, and sacrificial grout bit. 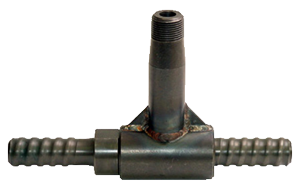 A grout swivel assembly is made up of a combination of a flushing collar, junction bar, and two seals. 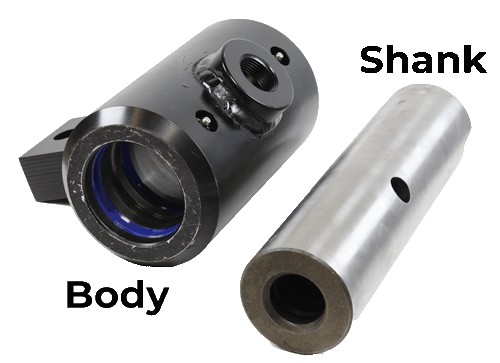 Stud rods are short sections of male to male rods that are used to extend the reach slightly and to adapt to different thread than what you may currently have available. 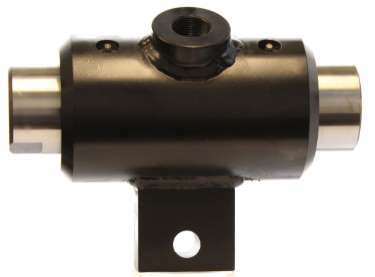 These are machined and heat treated for strength and longevity. Coupling adaptors are female to female and used to adapt to a different thread than what you may currently be running. 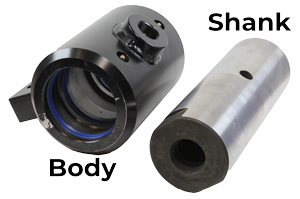 They are machined and heat treated blast-hole quality couplings. We keep a large variety in stock. Minimum order quantities may apply. Also threading Williams, Titan, and more. Minimum Order Quantity may Apply. 10% discount on orders of 100 or more for Carbide Cross and/or Button Bits. Also threading Williams, Titan, and more. Minimum Order Quantity may Apply.